Historically Chinese philosophy has placed importance on compassion for animals. However some think in recent decades China locate its priorities elsewhere. Others see ﻿Animal welfare and rights in China﻿ is a topic of growing interest and the ideas of animal welfare and animal rights were introduced to China in the 1990s. Animal-rights activists frequently condemn China's treatment of animals. Movements towards animal welfare and animal rights are expanding in China, including among homegrown Chinese activists. In more recent times, Prof. Peter J. Li suggests, many in mainland China have become relatively indifferent to animal suffering, perhaps partly because of Mao Zedong's campaigns against bourgeois sentiments, such as "sympathy for the downtrodden". Caring about animals was regarded as "counter-revolutionary". Since 1978, China has emphasized growth and avoidance of famine, which the government considers important for political stability. Local officials are evaluated based on local jobs and revenue. This has led to less concern for animal welfare. Livestock farming has grown exponentially in China in recent years, such that China is now "the world’s biggest animal farming nation." In 1978, China collectively consumed 1/3 as much meat as the United States. By 1992 China had caught up, and by 2012, China's meat consumption was more than double that of the U.S. The 2010 documentary San Hua by Guo Ke is the first to depict China's cat-meat industry. 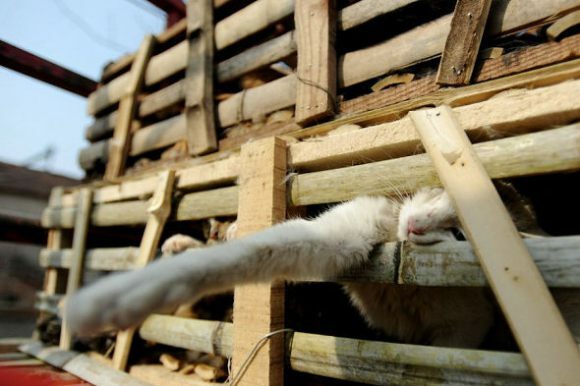 In one scene, Guo and fellow activists stop a transport truck and find "more than 300 cats crammed into cramped wooden cages, unable to move"—some missing tails and others "crushed into unconsciousness." In another scene at Fa's Cat Restaurant, Guo used a hidden camera to film cooks beating cats with a wooden stick, dumping them into a fur-removal machine, and then boiling them. Pictures have also circulated featuring two dogs in boiling water in China. It's claimed this is because some Chinese prefer the taste of adrenaline-soaked meat. In some areas, dogs are beaten to death in order to release blood into the meat. Yin Yang fish involves deep-frying fish while it's still alive. The practice has been condemned by animal-rights activists. Many chefs in Taiwan are no longer willing to prepare it, but it's popular in mainland China. Some chefs cook a carp's body while keeping its head wrapped in a cloth so that it can keep breathing. In 2009, a video of Chinese diners prodding and eating alive a fried fish went viral on YouTube and provoked an outcry from PETA. On streets in China, live scorpions are "scooped up alive and wriggling, skewered on a kebab, and deep-fried in oil." Drunken shrimp are eaten while struggling to get away. One tourist visiting China described eating drunken shrimp as follows: "Everyone at the table reached into the bowl, chose a particularly feisty little (or rather quite big) shrimp, and placed him on their plate. As poor Mr. Shrimp jumped up and down [...] you picked him up, ripped off his head, and proceeded to peel him as fast as you can." Asian palm civets are farmed in battery cages to produce Kopi Luwak ("civet coffee"). China has a $32 billion beauty market, and over 300,000 animals are thought to be used each year for required product tests. 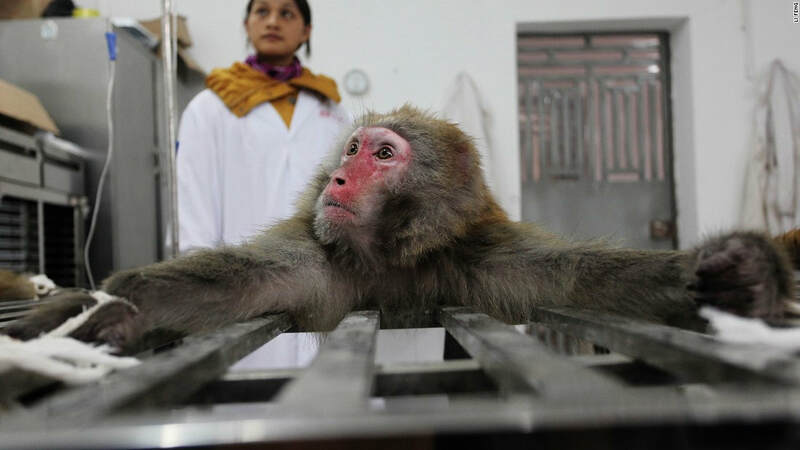 China is the only major buyer where mascaras and lotions need to be tested on animals. On 30 June 2014, CFDA eliminated its requirement for animal testing of "ordinary cosmetics" like shampoos and some skin-care items as long as companies provided alternative data showing safety. This change does not extend to imported cosmetics or to "any special-use products, including hair dyes and sunblocks." Also, some animal tests are likely to continue for now even on exempt products because some testers do not have the technology for alternative in vitro methods. Still, animal activists were excited by the announcement, and over 50 of them took to the streets of Dalian in northeastern China to celebrate, wearing bunny ears. According to Prof. Peter J. Li, a few Chinese zoos are improving their welfare practices, but many remain "outdated", have poor conditions, use live feeding, and employ animals for performances. Safari parks may feed live sheep and poultry to lions as a spectacle for crowds. 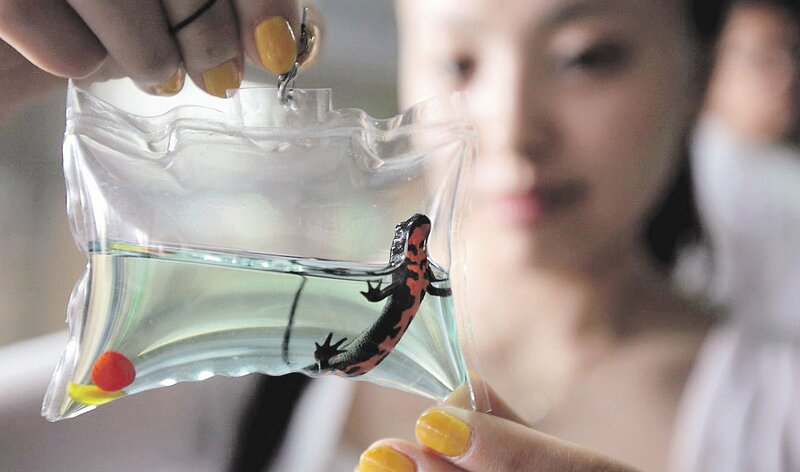 In Beijing, vendors sell fish, turtles, and amphibians as key rings and mobile-phone decorations. Animal-rights activists condemn the practice because the animals may run out of air and die quickly, and they may also pose hazards to human health. An Avaaz petition against these keychains had 980,000 signatures as of July 2014. Ideas of animal welfare and animal rights were introduced to China in the 1990s.- China's animal-protection movement is growing, particularly among young people, especially those in urban areas and on the Internet. International NGOs played some role in igniting China's animal movement, but local groups are increasingly taking over. 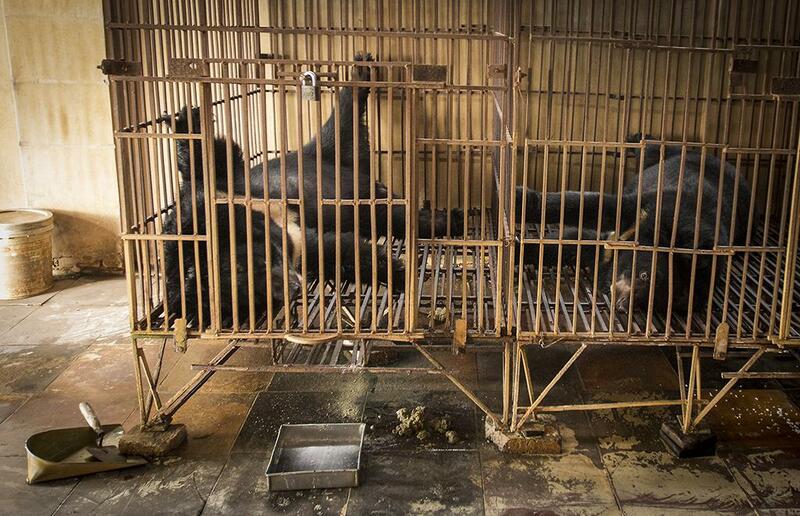 China currently has no animal-welfare laws. In 2006, Zhou Ping of the National People's Congress introduced the first nationwide animal-protection law in China, but it didn't move forward. In Sept. 2009, the first comprehensive Animal protection law of the People's Republic of China was introduced, but it hasn't made any progress. 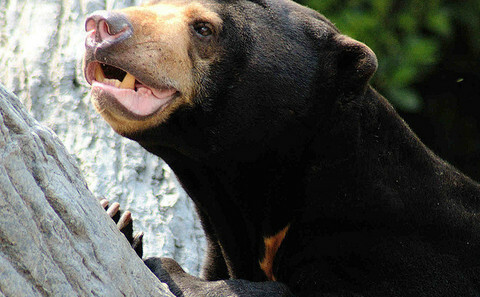 As critics point out, Nanyuan's cold outlook ignores the following truism: "Granted, these animals do not have all the desires we humans have; granted, they do not comprehend everything we humans comprehend; nevertheless, we and they do have some of the same desires and do comprehend some of the same things. The desires for food and water, shelter and companionship, freedom of movement and ﻿avoidance of pain﻿." It has been widely criticised, and dubbed an “animal utilisation law” as it encourages captive breeding and training of wild animals, rather than conservation and protection. Chinese experts are now calling for a new emphasis on animal welfare and conservation policies, and say the new law will fail unless it discourages trading in wildlife. A draft law is due to be considered by the National People’s Congress (NPC) Standing Committee in 2015, according to the official Xinhua news agency. Habitat destruction, hunting and trapping are the main threats to China’s wild animal populations, and critics say the existing Wild Animal Protection Law is often powerless to help. A report from World Animal Protection argues the current law only offers protection in order to allow for utilisation of wild animals, saying, “Only when the focus is on protection will this law be worth of its name." During the 2013 meeting of the National People’s Congress, delegate Luo Shenglian, who is also a deputy dean of Nanchang Hangkong University, joined forces with 36 other representatives to request a revision of the animal protection law. Their proposal – which gained wide attention -- urged dropping use of the phrase “wild animal resources” as it emphasises wildlife utilisation rather than protection.